Togo by Kate Klimo. A Dog Diaries Book. 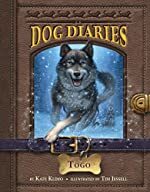 Review: The book Togo is a good book starring a sled dog named Togo. This Dog Diaries story begins with a look at the end of Togo's adventure in an arena being praised by many humans. Togo is the runt of his litter until a woman comes to see him every day and feed him his milk. After a couple of months he becomes stronger and gets his opportunity to become a sled dog. The author of the book Togo is Kate Klimo, and she has written over 25 books in her lifetime. She says that Togo is one of her favorites. This book is a good read for middle-school readers, and for any reader who loves dogs. We would like to thank Random House for providing a copy of Togo for this review. Have you read Togo? How would you rate it?